Since it’s inception, Clear View Alliance (CVA) has worked to understand, clarify and inform concerned citizens and the general public about the wind transmission lines issues. We have offered suggestions for what citizens can do to protect the Hill Country and their communities from ill-planned energy sprawl. We have attended public meetings. Our efforts and our presence have made a difference. For background on the wind transmission issue please explore the following links and visit the CVA website “In the News” page. The best description of these efforts and explanation of the issue is in the opinion, “Scarred Forever: No turning back once transmission lines are built” by Bill Neiman, CVA president, published in several newspapers in mid-September . Click here to read the opinion. CVA members have attended many public meetings and met with individuals to encourage involvement of state, county, city and civic leaders. Several leaders have made public statements regarding the detrimental effects of the transmission lines on our way of life. CVA brings communities affected by wind transmission lines, as well as liked-minded organizations and individuals together through this website and our E-mail listserve. For links to other organizations with similar missions, click here. 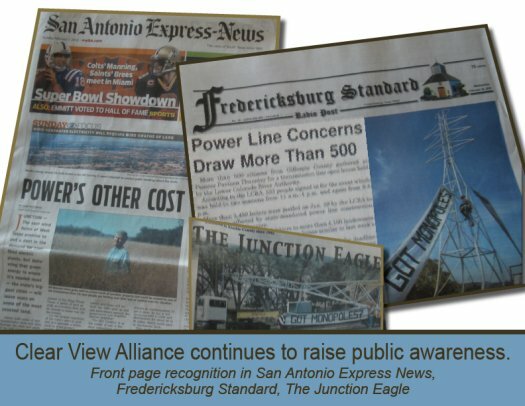 Clear View Alliance continues to be in the forefront of creating public awareness around the LCRA's critical decision regarding transmission lines routes and the type of infrastructure used for the installation of these lines. Innovative members volunteered to build a quarter-scale model tower and residence to show the impact of the monstrous lattice towers. They gave $7,000 and almost 500 hours of work to build the tower, drive the tower to open houses, create informational brochures, as well as greet people and give them the information at the open houses. If you would like to see this kind of publicity continue, you can help by donating money to recover cost of building the model tower and/or get involved in spreading the information. Some Clear View Alliance members have created a 1/4 scale model of a lattice tower and a model home which is being displayed at the open houses to show why we are opposed to the lattice towers and are fighting for single pole towers. See a slideset here showing the construction process. To paraphrase Paul Revere, “The transmission lines are coming.” Hill Country residents must stand together and fight to maintain the qualities of this region. The CREZ project is being conducted in the name of green energy, but the process is political. Although LCRA is building the lines, the Public Utility Commission will decide our future. The PUC commissioners must hear – loud and clear -- that Hill Country residents want the new transmission lines to following existing rights-of-way, not be slashed through virgin territory. The PUC commissioners must hear – loud and clear—that Hill Country residents want to LCRA to use monopoles instead of lattice towers …throughout the entire project to minimize visual pollution to the native viewscape. Our voices count. Because the Clear View Alliance spoke up, the PUC ordered LCRA to look at a much broader area that includes two existing rights-of-way as it decides the transmission line route. 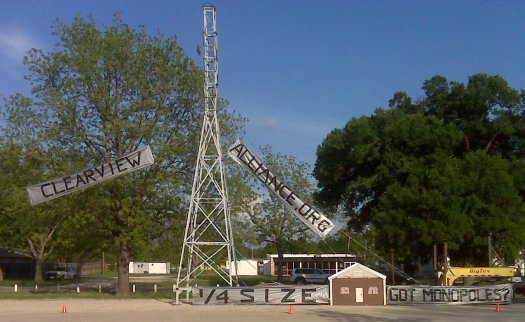 Because the Clear View Alliance spoke up, the LCRA has stopped ordering lattice towers for the time being. Of course, that could change tomorrow. The clock is ticking. We have until July 6 to make a difference. Momentum and passion is on our side. Texans, regardless of where they live, love the Hill Country region. We must protect it, not only for our children’s children, and ourselves, but for all Texans. Get informed. Join us. Make a donation. Make a difference. Read about ways to get involved here. Watch the videos on the Home Page and send the link to your friends. For more details about how you can get involved, visit the Get Involved section of the CVA website.